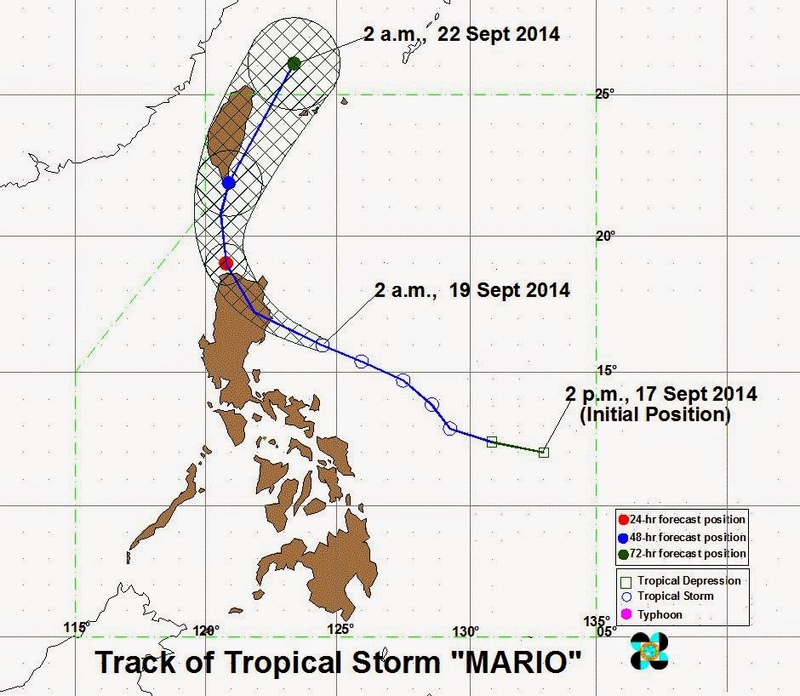 The State Weather Bureau update for Tropical Storm Mario as of 5 AM advisory, Bagyong #MarioPH was estimated at 154 km East Northeast of Casiguran, Aurora (16.7N, 123.5E), according to PAGASA. PAGASA forecast Bagyong Mario was moving West Northwest at 22kph with a maximum winds of 85 kph near the center and gustiness of up to 100 kph. Tropical Storm and the southwest monsoon are combined and may bring moderate to heavy rains and thunderstorms over Metro Manila and the rest of Luzon. PAGASA announced the Severe Flooding in the following areas, Metro Manila, Rizal, Bulacan and Laguna. While in the Bataan, Cavite, Batangas and Quezon, Flooding in low-lying areas may still prevail over these areas. The provinces of Cagayan including Calayan and Babuyan group of islands, Isabela, Kalinga, Mt. Province, Abra, Ilocos Norte and Apayao will experience stormy weather with rough to very rough seas, while cloudy with moderate to heavy rains and thunderstorms which may trigger flashfloods and landslides. for Metro Manila. In addition to this advisory, Visayas will have cloudy skies with light to moderate rains and thunderstorms. Mindanao will be partly cloudy to cloudy with isolated rainshowers or thunderstorms. For more information about the Bagyong Mario Weather Update (September 19), kindly bookmark this page and share to your joined social networking sites. Comments or suggestions about "PAGASA Update: Bagyong Mario and Habagat bring heavy rain (September 19)" is important to us, you may share it by using the comment box below.